Adam KalseyAdam Kalsey leads the Webex Developer Relations team. We had a busy week in Barcelona last week at Cisco Live Europe. The training sessions and workshops in the DevNet Zone were standing-room-only affairs, with people crowding around to see how to use our latest features, get started with the basics, or just dive deep into something they've already used. 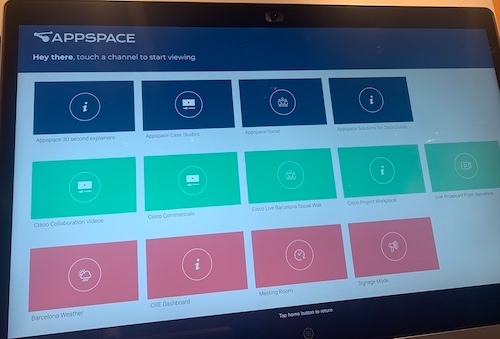 AppSpace using the upcoming Signage Mode on the Webex Board. Super cool to see how a Webex developer is using this to deliver some amazing applications. Hands on with the RoomKit Mini, set up in a small room so we could see how it worked in real-life. One cool feature that's unique in the RoomKit lineup is USB input. Plug your computer in and the Mini becomes a 4k Webcam, complete with speakers and microphone. The Mini even has all the same APIs as its bigger siblings. Jabber Team Messaging mode turns our enormous Jabber customer base into Webex Teams messaging users. The developer angle here is that in a future release the same bots and integrations you've built for Webex Teams will work in Jabber for customers that enable this feature. We had a great time at Webex After Dark, meeting and hearing from some of the Webex Ambassador Masters over cava and tapas. They talked about how the Collaboration business has changed since they got started in it (it's gotten easier, cheaper, and more ubiquitous), and where they think it's going. Next up is Cisco Live Australia-New Zealand in Melbourne, March 5-8. Will we see you there?